One of the worlds most beautiful vineyard locations, Klein Constantia is just 20 kilometres from the centre of cape Town. The 146 hectare estate, with granite soils on slopes gently cooled by ocean breezes, was chosen not only for its beauty, but also for the quality of the decomposed granite soils which offer a unique viticultural environment. 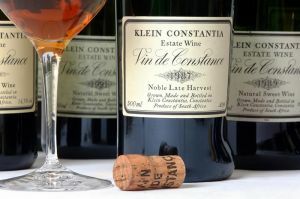 The Estate produces the legendary dessert wine Vin de Constance, beloved by Napoleon, Charles Dickens and Jane Austen along with a collection of elegant Estate wines which express minerality and balance from traditional grape varieties of the region. All wines are produced in environmentally responsible and biodynamic ways, and Klein Constantia is a Biodiversity in Wine Initiative Champion.